Urban areas are home to over 40% of the people living in West Africa and are already stressed due to unfavorable socioeconomic conditions. The main objective of the chapter is to identify evidence gaps and map out the climate change adaptation policy process in the urban areas of West Africa. The chapter identifies the main research streams in urban climate change adaptation using qualitative approach. In addition, guided interviews were conducted among the key stakeholders to elicit information on the urban climate change policy processes. This chapter identifies a number of research priorities for the subregion that could be carried out at the city level. One of the critical outcomes found weak links among the key actors on the governance, planning, and implementation of climate change programs in urban areas. In essence, most of the plans of action are either implemented without consideration for the development programs or not considered because of an array of factors such as finance constraints, weak institutional structures, and lack of political will. The chapter concludes that in order to build climate change resilience in the urban areas of West Africa, state and local governments should take the lead and formulate policies that address unsustainable use of resources, shortage of technical competence, unsustainable growth, uncontrolled environmental degradation, and bad governance. Urban areas will experience the same exposure to “new” climates as their surrounding environment. However, the urban setting has particular characteristics within the context of its form and socioeconomic activity which could alter its exposure as well as impacts at the local scale. For instance, built-up areas in the cities create unique microclimates due to the replacement of natural vegetation with artificial surfaces (EEA 2012). The change in this microclimate would bring about greater changes in the air temperature, wind direction, and precipitation patterns, among others. Climate change would intensify many of these parameters and alter intra-relationships including “factor compensation” (Odum 1971) impacts on others. There has been an increasing level of urban growth in West Africa since the 1950s. This growth has been attributed to both natural increase in population and urbanization. Climate change impacts will not only affect the high concentrations of population living in the cities along the coastline of West African countries but also the capital assets (Dodman and Satterthwaite 2008) and the critical role of ports in the national economies. For instance, the sea level along the coast of West Africa is projected to rise by 0.13–0.56 m by the 2090s, relative to 1980–1999 levels (Boko et al. 2007), with Lagos likely to be impacted by tidal flooding (Boko et al. 2007; Hewawasam 2002). Over half of the world’s population now lives in urban areas (Buhaug and Urdal 2012), and the majority of the high growth trend is located in the developing countries (Duh et al. 2008). The global trend has been very evident in many parts of West Africa, with far-reaching impacts. Scientific evidence suggests that global climate change will have considerable implications for urban areas in West Africa. Some of the key climate-related hazards and trends already observed include heat waves, rising sea levels, and increased incidence of extreme events (Feiden 2011). For instance, analyses of rainstorms on Lagos Island between 1971 and 1995 show that in more recent years (1996–2005), rainstorms have been heavier, even though the number of rain days per annum has decreased (Adelekan 2010). Many of the impacts of climate change are projected to affect significantly the cities located around the coasts of West Africa such as Port Harcourt, Lagos, Cotonou, Lome, Accra, Abidjan, Monrovia, Freetown, Conakry, and Dakar where populations, capita assets, and economic activities are already at risk (Jalloh et al. 2013; Dodman and Satterthwaite 2008; Nicholls 2004). People living in cities in developing countries, including those in the West African subregion, are vulnerable to the impacts of climate change for many reasons. These include unsustainable population growth such as unplanned high-density populations along West African coasts, urban populations living in informal housing, urban expansion on particularly risky sites as well as exposure to climate risks, and poor urban infrastructure (Bull-Kamanga et al. 2003; Lavell 2003). There has been an unprecedented increase in human population and urban development in recent times in the West African subregion. The subregion’s population is growing at an alarming rate. Climate change will increase existing urban system challenges in the subregion. Against this background, this chapter is carried out with a view to enhancing the knowledge base and to supporting research-based policy formulation for climate change adaptation in urban areas of West Africa. This chapter seeks to provide answers to the following key questions: What is the role of climate change in the context of the multiple challenges and opportunities facing urban areas in the subregion? What is the current state of knowledge on adaptation to climate change in urban areas in the region? What is the current state of knowledge on whether and how research findings are integrated in urban area policies in the region? What are the major gaps in research on adaptation to climate change in urban areas? What is needed to ensure that research findings are better integrated into urban area policies? What is the current state of knowledge on the stakeholders involved with research and policy on adaptation to climate change in urban areas in the region, and how can stakeholder involvement be improved? This chapter is structured into eight parts. The first section introduces the background and issues to be addressed in the chapter, while section two discusses the region’s urbanization profile. The methodology for the chapter is discussed in section three. Studies related to climate change adaptation in urban areas are assessed in section four. The chapter goes further to analyses the policies related to urban issues with regard to climate change in section five before enumerating the gaps in climate change adaptation research and policy in urban areas in section six. Section seven enumerates the key barriers to uptake of research evidence for policy formulation and implementation. Analysis of stakeholders and opportunities for collaboration is examined in section eight. The key conclusions and policy recommendations of the chapter are outlined in the final section. In 1960, the urban component of the West Africa was estimated to be only 19.6%, but in 2000, it had grown to 40.7%. With a population of over 250 million people and an estimated land area of 5 million km2, the West African subregion’s population is growing at an average annual growth rate of 3% (OHCHR 2011). This urban growth rate is still quite high by world standard (UNCHS 1996). There has also been an increase in the urbanization rates in all the countries in the West African region from 1950 through 2000, with lowest (16%) in Niger and the highest (46%) in Senegal. Urbanization rates close to or above 40% have been recorded by seven countries, all being coastal countries. The land expanse is 2.5 times the size of China and 1.8 times the size of the 27 European Union countries (Hiraldo 2011). Projections show that the population of the subregion could reach 430 m by 2020 (Cour 2001). The majority of the countries have a very young population, with over 40% of inhabitants being under 15 years of age (Hiraldo 2011). Another characteristic of urbanization in this region is the difference between the coastal and landlocked countries. Seven coastal and four landlocked countries have urbanization rates close to or above 40% and below 25%, respectively. Estimates have shown that by 2020, the majority of areas in the West African subregion will have at least one town of 10,000 inhabitants. The urban population of the subregion will thus reach around 124 million inhabitants. The average distance from one agglomeration to another has decreased considerably from 111 km to 33 km for the whole subregion and from 60 to 31 in urban areas (Africapolis 2009). Accessibility to towns and their services has therefore considerably increased. However, provision of transportation infrastructure is grossly inadequate. The situation is, however, different in most parts of Ghana, where the town network is less intense compared to the rest of the subregion, except for areas such as Kumasi and Accra where competition for economic rents has resulted in modest densification of the coastal areas. In Senegal, there is a hierarchical town network which is highly noticeable around Dakar. This has invariably raised the value of the land, leading to densification. The dynamic is different in Nigeria. For instance, the level of urbanization in Nigeria weighs heavily on the rest of the subregion as more than half of the population of West Africa is contained in this country. The majority of the cities has more than 20,000 inhabitants and are more connected when compared with the overall network of the subregion (Africapolis 2009). While Lagos maintains its supremacy in size over all other agglomerations in West Africa and indeed the entire continent, the national capitals of other countries have come to be viewed as major hubs in the West African urban landscape. Their growth has been faster than that of the old network of Nigerian cities. For instance, Lagos has grown relatively faster than Ibadan, whereas Conakry, Lomé, Cotonou, Monrovia, Ouagadougou, Niamey, Nouakchott, and to a lesser degree Bamako and Abidjan have consolidated their position among the 20 largest agglomerations in West Africa (Africapolis 2009). In general, the building of nation states in the region has been accompanied by a metropolization dynamic marked by the primacy of capital cities. It is important to note, however, that many West African countries are still in the early phase of urbanization with an average rate of 34% and 44% in 2000 and 2012, respectively (Population Reference Bureau 2012; Africapolis 2009). With economic growth rates of 5% in several countries and less political volatility, the urbanization dynamic and its associated transformations are expected to continue into the future (Hitimana et al. 2011). However, it has been noted that urbanization will bring another dimension to the issue of climate change in the subregion. This chapter focuses mainly on the climate change adaptation in urban areas of all the 15 member states of Economic Community of West African States (ECOWAS). These states include Benin, Burkina Faso, Cape Verde, Côte d’Ivoire, Gambia, Ghana, Guinea, Guinea-Bissau, Liberia, Mali, Niger, Nigeria, Senegal, Sierra Leone, and Togo. The majority of these countries share a great part of their natural resources and face common climate change challenges. Climate change has already been recognized as a key issue, evidenced by the emergence of regional initiatives such as the formulation of the Regional Plan of Action for Reducing Vulnerability in the Face of Climate Change in West Africa. Some of the organizations in the forefront of this initiative are ECOWAS, the Permanent Interstate Committee for Drought Control in the Sahel (Comité Inter-Etate pour la Lutte contre la Sécheresse au Sahel or CILSS), and the African Centre of Meteorological Applications for Development (ACMAD) (Niang 2007). The chapter was carried out using peer-reviewed journals, conference proceedings, gray literature, policy documents, technical reports, project documents, relevant government and NGO documents, and libraries over the past 15 years. These documents helped to synthesize scientific and indigenous knowledge as well as policies related to climate change adaptation and, in effect, the possible gaps that will form the basis for further research and policy formulation. Key informant interviews were used to complement the literature review and substantiate the facts gathered from the literature. Although there have been numerous research activities on climate change in the last several decades, only recently has attention been focused on climate change implications for urban areas, and there has been little research to date in West Africa (Okali et al. 2012; Adelekan 2010; Ruth and Coelho 2007). Some of those that are available are not documented in the mainstream publication outlets, and some are written in other languages such as French. In order to achieve the goal of this chapter, relevant unpublished government documents were obtained from various agencies through their websites and phone calls. The same approach was used for NGOs, particularly those that are located in Nigeria. In a bid to overcome the challenge of personally engaging with key stakeholders, assistance was sought from the focal point of the AfricaInteract project in the region, consultants for the other thematic areas and other colleagues in the subregion. Google Translate was used in translating documents that were written in French. The impact of climate change is global and its complexity and scope require cities and other levels of government and stakeholders to collaborate and find innovative ways to surmount the challenge. With increasing scientific knowledge on global climate change, there are strong indications that some impacts will be unavoidable. Adaptation therefore will become a major instrument in reducing the socioeconomic costs of climate change and poverty in Africa (GLCA 2009), and particularly in cities where the success of social and economic policies is crucial (World Bank 2010). According to IPCC report, some of the projected impacts of climate change in West Africa include rising temperatures, rising sea levels, and changes in the variability of rainfall (Parry et al. 2007). However, there are considerable uncertainties in the climate projections for West Africa which make many of these unreliable (Perret 2008). In the meantime, over the years, there has been a significant improvement in the science of climate change, and this has increased the level of accuracy of regional climate change projections. As long as estimates of some climate change impacts are based on climate projections, there will always be elements of uncertainty in decision-making. This issue has generated debates on how to make decisions on climate change adaptations under uncertainty. However, there is a widely held view that adaptation efforts should not be limited by the lack of reliable (accurate and precise) foresight about future climate conditions. Rather, stakeholders should use a range of plausible representations of future climate to help decision-makers appreciate where vulnerabilities may lie so that appropriate policies can be made (Dessai 2005). Meanwhile, there is a gloomy picture for Africa in terms of high intensity of global warming on the continent in the twenty-first century (Boko et al. 2007; Christensen et al. 2007). According to the IPCC Fourth Assessment Report (Parry et al. 2007), the average rise in temperature between 1980–1999 and 2080–2099 would be between 3 °C and 4 °C for the continent as a whole, which is about the same as the global average of 4 °C for the best estimates under the A1F1 scenario. With respect to rainfall, there will be impacts in the Sahel bordering the Sahara desert and the West African coast up to Dakar. Meanwhile, the majority of large, high density cities in West Africa are located in coastal zones where they are exposed to high tides, coastal erosion, flooding and sea level rise. Lagos, for instance, has been referred to as one of the 50 cities most at risk from extreme sea level rise and yet is projected to experience a more than 800% increase in population by the 2070s (Nicholls et al. 2007). The number of slums in the city was estimated at about 100 in 2010, containing almost 70% of Lagos’s population (Adelekan 2010). The same scenario is true for most of the other West African cities along the coast. These impacts add to the challenges of providing for the urban poor and under-housed whose needs are already enormous without the additional stresses brought by climate change. These categories of people are usually the most vulnerable to the impacts of climate change, often residing in low-lying areas or on steep slopes with little to no infrastructure or basic amenities to protect them from extreme events and other vagaries of climate (Adelekan 2010; Nicholls et al. 2007; Soyombo 2006; Mabogunje 2001). For instance, urban slums with a high density of buildings are likely to experience more intense heat waves than areas that are well planned. Those built along steep slopes are also susceptible to mudslides or landslides in the event of heavy downpours or other extreme events. Issues such as these have been compounded with absence or lack of enforcement of building codes which were primarily formulated to address these concerns. Besides the vulnerability of the urban poor, social and cultural factors such as ethnicity, class, religion, and gender also affect the adaptive capacity of the urban poor. For example, gender-specific roles often create structural differences between men and women through their interactions with society, work, and domestic life, with consequent impacts on their abilities to adapt to climate change (Adger et al. 2007). It is from this perspective that understanding the interactions between the urban environment in West Africa and global climate change is imperative. From the foregoing, it seems clear that the risk posed by climate change to West Africa’s future sustainable development objectives is quite real (Boko et al. 2007) as more than 60% of the population living in the cities are regarded as poor. In order to reduce such risk, cities need to be climate resilient and strengthen the adaptive capacity to cope with the impacts of climate change. 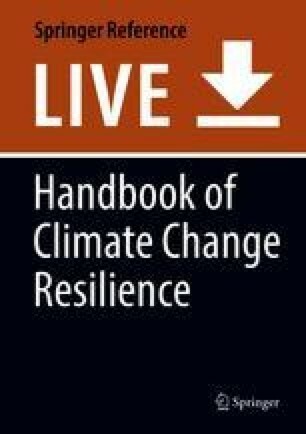 Within the context of this chapter, resilience is defined as the ability of a social or ecological system to absorb disturbances while retaining the same basic structure and ways of functioning, the capacity for self-organization, and the capacity to adapt to stress and change, while the adaptive capacity is the ability of a system to adjust to climate change (including climate variability and extremes), to moderate potential damages, to take advantage of opportunities, or to cope with the consequences (Parry et al. 2007). Climate change adaptation varies according to localities or municipalities, countries and regions, as well as social groups. For example, the urban poor tend to have more limited adaptive capacities with regards to climate change impacts on human settlement. Secondly, they are usually less mobile as a result of economic or cultural constraints, and this limits their ability to move to a less vulnerable environment. In addition to earlier constraints, they are more dependent on climate sensitive sources for their livelihoods (Feiden 2011). In the same vein, economic activities in the coastal cities of West Africa are highly vulnerable to the impacts of climate change. Extreme events could damage infrastructure and affect the provision of electricity, water, and sewerage systems necessary for socioeconomic development. The rise in sea level and associated erosion threatening coastal industrial and residential areas could raise salinity levels, thereby changing the volume, timing, and quality of surface water available for industrial and domestic purposes (Gasper et al. 2011). Many of the urban poor, most especially those living around the coastal cities with houses in swampy lands or dwellings built on stilts in tidewater areas, are vulnerable to increased storminess and rising sea levels. Although these impacts are not limited to the urban poor alone, the rich city-dwellers are better able to protect themselves from adversity by insuring their valuable property as well as their lives. In the West African subregion, some of the cities most exposed to climate risk in the coastal lowland areas are Lagos and Port Harcourt in Nigeria (Abam et al. 2000), Cotonou in Benin, and Banjul in The Gambia. It has been reported that Banjul could disappear in 50–60 years through coastal erosion and sea level rise, putting more than 42,000 people at risk (Jallow et al. 1999). Many of these cities have found several ways of adapting to these impacts. However, these strategies might not be able to stand the test of time. For example, in the Alajo community in Accra, people dealt with the June and July 2006 floods using bricks, stones, and furniture to create high places on which to put their most critical valuables. Some of the inhabitants also temporarily moved away from the area to stay with friends and family. Another important aspect of climate change adaptation in the urban areas is the culturally defined gender roles with regard to socioeconomic activities such as agriculture, water, and energy resources. Many studies argue that due to the culturally determined roles they often play out in the household and society, women and girls have particularly important roles to play in the development of sustainable cities under the advent of climate change. For instance, women are often crucial in creating resilient urban livelihoods. They tend home gardens and produce higher value vegetable and fruit crops that help diversify agricultural production in peri-urban areas. This can become especially important to the household when a natural hazard hits. This social support system is very important in building resilience to climate change impacts among the urban poor and other socially disadvantaged city-dwellers. Women and men have also expressed their coping strategies by diversifying their crops, investing human capital in the form of time and labor. In Niger, men, as the head of the family, regularly sell their livestock to sustain the household, while most women retain their own livestock. The women, however, make use of these livestock during natural hazards. The implication of this is that women use livestock as a safety net for the household during natural hazards (Kristjanson et al. 2010). This example demonstrates interconnectivity between resilience, climate change impacts, and gender differentiated roles. Another important issue with regard to dealing with rapid urbanization and climate change impacts in West African countries is that of building resilient urban infrastructure. Within this context, the ramifications of the impacts and disruptions of infrastructure caused by natural hazards rest on the costs associated with the clean-up, repair, and/or replacement of affected infrastructure. In most cases, however, economic, social, and environmental effects are also felt through the disruption of supply chains, suspension of economic activities, and damage to social well-being (DOE 2012). This example is particularly true of many West African cities with sea port facilities in countries such as Benin, Ghana, Nigeria, and Senegal. Another implication of climate change impacts on coastal facilities is the disruption of services rendered to relatively distant landlocked countries such as Mali and Niger through international infrastructure networks. Any disruption to the services rendered to these countries will affect their socioeconomic development. Climate change hazards such as sea level rise, storm surge, and flooding could affect all infrastructures in the urban areas with resounding impacts. For instance, coastal flooding will not only affect transportation services but also water, energy, and communications, in the same geographic area (DOE 2012). In Benin, for example, many key pieces of urban infrastructure such as the fishing port, international airport, and conference center to the south of Cotonou are threatened with coastal erosion. This example illustrates the level of interdependence among different types of infrastructure that are vulnerable to climate change impacts (Kirshen et al. 2008). One of the distinguishing features of adaptation is that it is essentially local. That is, the actions required to adapt are local activities, the aggregate effect of which reduces vulnerabilities to the impacts of climate change and hence the need for urban climate change adaptation policy. To date, no country in West Africa has a specific urban climate change adaptation policy. Rather, what the majority of these countries have is a national climate change policy, national climate change framework, national communication to the United Nations Framework Convention on Climate Change (UNFCCC) for the Least Developed Countries (LDCs), or a National Adaptation Programme of Action (NAPA). Coming closest to urban climate change adaption policy are climate change or environmental plans of action at the level of provinces or states, as exemplified by those existing in Lagos, Bayelsa, and Ondo States in Nigeria. Countries such as Ghana, Nigeria, and Senegal only have dedicated national climate change (adaptation) strategies, plans, or frameworks. On 12 September 2012, the Federal Executive Council of Nigeria officially approved a National Climate Change Policy and Response Strategy document (Okali et al. 2012). A Department of Climate Change has been established in the Federal Ministry of Environment to coordinate all the activities on climate change in the country (NEST 2011; Stern 2007). Ghana has also developed a National Climate Change Adaptation Strategy and National Climate Change Policy as well as established a National Climate Change Committee (GMEST 2012). The same situation is true in Niger which now has a National Strategy and Action Plan for Climate Change and Variability. There is also a weak link between research and policy on urban climate change adaptation in West Africa. However, studies have been carried out in countries such as Benin, Burkina Faso, Nigeria, Ghana, Sierra Leone, and Cape Verde to explore such relationships. Scientific evidence makes it clear that climate change will impact on near- and long-term development prospects in West African countries, with urban dynamics bringing a new perspective to the discourse. To this end, many adaptation plans of action at the national and regional levels have been identified and carried out to build resilient cities in the subregion. However, as revealed by a close study of literature on the subject, there are research areas that are either not dealt with or improperly addressed. This chapter identified specific knowledge gaps in the climate change adaptation plans of action and policies where certain issues are either not considered or not integrated into development plans and strategies. In all, it appears that very few research activities have been carried out specifically on climate change adaptation in the urban areas of West Africa. With respect to urban areas, evidence-based research activities were carried out on particular sectors or themes. These include flooding, sea level rise and storm surge in coastal cities, droughts, food security, and infrastructure damage from extreme events, sanitation, water demand and availability, urban biodiversity, and air pollution. Most findings were on coastal cities, and there is little information on inland cities with the exception of studies conducted on Aba, Nigeria, and Ouagadougou, Burkina Faso (IDRC/DFID (2013), UNFCCC (2012), Moser and Ekstrom (2010), De Vit and Parry (2011)). There is also a major evidence gap on the quantification of climate change impacts on urban energy usage, rural-urban migration, infrastructure (sea ports, roads, water utilities, energy utilities, waste management systems, etc. ), and water resources. Furthermore, a very few research activities were carried out on cost-benefit analysis of such impacts on cities in West Africa. There are a number of uncertainties surrounding the climate change projections for the West African subregion, especially as these relate to rainfall and low densities of synoptic stations across the subregion. For example, it is still unclear whether the observed changes in the climate of the subregion are part of a normal climatic cycle or an indicator of climate change (Conway 2009). However, there is general consensus in the scientific literature that the continent of Africa will warm more than the global average in the future. The uncertainties in the projection of climate change in West Africa are largely due to the fact that most of the regional models available today cannot effectively project the climate of the subregion for accurate forecasts of key climate parameters such as rainfall and temperature, not to mention city-scale projections. This issue is further compounded by local microclimates and particularly urban heat island effects in the major cities across the subregion. This goes to show that there is still a deficit of knowledge on the key interrelated processes that drive Africa’s climate. However, it should be noted that there are some initiatives at some national levels which could be scaled down to city-level scales. Such initiative include Nigeria’s effort in the National Adaptation Strategy and Plan of Action on Climate Change for Nigeria (NASPA-CCN) where experts were invited from the Climate Systems Analysis Group (CSAG) at the University of Cape Town to develop climate scenarios for Nigeria. Research on gender varies and is highly contextual, based on the social and cultural norms within the country of interest in the subregion. In general, some level of research activities have been carried out on the impacts of climate change on vulnerable urban groups such as women and girls. Although the literature suggests that women seem to have suffered more negative impacts of climate change in terms of their assets and wellbeing, there are some exceptions where men seem to have suffered more impacts than women. As a result of this, more research is needed in this area before strong conclusions can be drawn. More importantly, there is the need to expand the knowledge frontier with regards to climate change impacts on gender in the urban areas through multidisciplinary research. Green growth has been defined as a means to create jobs and economic growth while reducing costs and environmental impacts over the long run (Hammer et al. 2011). Many industries in the urban areas of West Africa are engaged in the production of products with large carbon footprints. However, many of these are in the process of developing sustainability standards for their products so as to reduce their level of carbon emissions. Companies committed to this kind of change are very interested in tools that will help them measure the environmental benefits (reduction in footprints) of the changes they are making to their products as a result of environmental policies on climate change or organizational principles. Research is needed to develop tools which will help them measure their footprints in the cities and other areas surrounding them where their customers are concentrated. In all, there is no common protocol or methodology with which to assess a city’s sustainability in the subregion. Very few policy documents such as NAPAs, national communications, climate change policies, national climate change adaptation plans, and frameworks address city-scale adaptation initiatives. Exceptions to this are Ghana’s National Climate Change Policy (GMEST 2012) and Niger’s NAPA documents. As stated earlier, these countries do not have dedicated urban climate change policies; rather what they have are national climate change adaptation plans of action that are mainstreamed around building resilience to climate change impacts in the cities. For instance, Nigeria’s national plan (NASPA-CCN) laid out strategies to discourage unsustainable population growth such as building and urban encroachment into vulnerable areas, high risk zones, and low-lying areas. In the same light, Ghana’s climate change policy articulated issues surrounding increased rural-urban migration that could add to the pressure on cities and urban services in a bid to find lasting solutions to these challenges (GMEST 2012). In other words, there is the urgent need to develop policy that will address issues of climate change impacts at city-scale level in the subregion. While examining the exigencies available to reduce vulnerability to the impacts of climate change in the urban areas of the subregion, adopting City Adaptation Programmes of Action (CAPAs) or the related Local Adaptation Programmes of Action (LAPAs) might be viable options (Satterthwaite et al. 2007). These frameworks are bottom-up approaches to address impacts at the local level of governance. These strategies are particularly suitable for urban climate change adaptation programs. This is because the people who are directly impacted are local, and as such, adaptation strategies to increase resilience of the people should also be local. This framework could also be used to treat smaller scale adaptation programs, most especially for the settlements or areas most at risk such as urban slums. These two initiatives do not have to be completely new programs; they could be carved out of the original programs, such as NAPAs, so as to facilitate their implementation from mainstream funding mechanisms such as the Adaptation Fund. As climate change impacts in the cities intensify, challenges of heat waves, coastal flooding and erosion, sea level rise, food shortages, infrastructure damage, and the degradation of natural resources upon which livelihoods are based will be exacerbated. For these reasons, climate change adaptation policy is urgently needed at city-scale across the countries in the subregion. Very few countries in West Africa have successfully integrated climate change adaptation into other sectoral policies (Osman-Elasha and Downing 2007; Satterthwaite et al. 2007) such as urban sector. Perhaps Ghana’s National Climate Change Policy Framework, which later developed into the Ghana National Climate Change Policy 2012 (GMEST 2012), is a good illustration of how climate change adaptation policy could be mainstreamed into urban planning policies. For instance, this policy document is committed to a low carbon future which means improved city planning and a more modern public transport system based on high occupancy buses running in dedicated lanes. An intercity rail service between Accra and Tema has also been developed. Adaptation to climate change impacts in urban areas requires the joint efforts of households, private sector, governments, knowledge institutions, NGOs, civil societies, and other stakeholders. Meanwhile, not every stakeholder is aware and informed about its vulnerability and strategies they can use to adapt to climate change impacts in the cities. Awareness campaign and education are therefore critical aspects of the climate change adaptation process to manage the impacts of climate change, increase adaptive capacity, and minimize vulnerability. Awareness campaigns can be directed at households in a region or subregion affected by a particular climate threat. Awareness campaigns can also be targeted at policy makers, civil servants, the general public, etc. Such awareness campaigns and climate change education are important strategies that can be used to address the knowledge of individuals and organisations on the issue of climate change impacts. They can also be tailored towards ensuring that key regional and subregional stakeholders have full understanding of climate change impacts and be able to respond appropriately. Awareness campaign and education can also be used to bring about behavioral change among the populace in a particular region. There are several channels through which important messages from the awareness campaign can be communicated. Some of these channels include distribution of printed materials; town hall meetings; professional associations; information dissemination and training in primary and secondary schools; information sharing on social media; information sharing among informal networks. Raising awareness of the general public and educating them on climate change impacts are difficult tasks as level of awareness often fluctuates depending on the context and situation at a particular point in time. As such, it is important to frequently measure the efficacy of the awareness campaigns and climate change education using appropriate metrics. In view of this, there should be a policy that mandates appropriate agency or department in each country of the subregion to carry out this important task. Technical and institutional capacities: Many state or municipal governments and their agencies in the subregion are usually understaffed or over-burdened, especially with respect to technical members of staff. Besides, most agencies of government in the West African subregion lack the technical capacity to interpret and use climate risk data or hydro-meteorological information in an adaptation development project. In the same vein, budgets at the state level are in general meagre, barely enough for the state administration let alone earmarking any money for urban climate change adaptation. In effect, most state governments do not have adequate financial and human resources to implement climate change adaptation programs in the urban centres. The effect of this barrier could, however, be reduced if there is a synergy among the implementing agencies/ministries at different levels of government. Dysfunctional institutional structures: Tedious and complicated bureaucratic processes in some state agencies are known to have hampered the integration of adaptation into community decision-making in the urban areas. A case in point is that of The Gambia where bureaucratic red tape has been identified as a key organizational barrier, delaying the delivery of climate change adaptation project outputs (GOTG 2007). Another example is that of Cape Verde where implementation of adaptation actions has been made difficult as a result of the proliferation of institutions operating without an efficient coordination mechanism; a deficiency in the functioning of the regulatory entity; overlapping of attributions among state institutions; and deficient knowledge of the law by the institutions (UNDP 2010). Meanwhile in Nigeria, the land tenure system does not allow for proper land use planning. For instance, only the Governor of a state can declare parts of the state territory governed by him or her as an urban area, through an order published in the state gazette. Lack of easy access to land could prevent people from adopting certain resilience-building strategies in the urban centres as they are not sure of their investments on such property. Lack of technical information: As stated earlier, one of the major challenges of climate change predictions in West Africa is the ability to make projections that can be used at local levels. The absence or inadequacy of this technical information at state level could hamper adaptation development planning in the urban centres. The majority of the climate projections that are available today are regional, with little or no relevance at the city level. Although there are regional agencies and institutions that are working on downscaling global and regional climate models for use in West Africa, those that are available now still fall short of what is needed to implement city-wide adaptation initiatives. However, these regional models serve as a basis for many adaptation plans and strategies in the absence of city scale models. Local competing priorities/needs: Most of the West African countries are bedeviled with developmental and security challenges which are competing for the attention of both the local and national governments. It is within these challenges that climate change is competing for resources with other needs on the development agenda such as food security, job creation and access to primary education (OECD 2009). Unfortunately, in many cities of developing countries such as those in West Africa climate change impacts are not usually perceived as issues which deserve urgent attention and as such do not get the attention of the government or policymakers who could allocate resources for climate change policy implementation. Inappropriate channels of funding: Another important challenge affecting urban climate change adaptation research uptake for policymaking is funding. This concern is coming from the fact that the implementation agency for adaptation funds usually works with the national public institutions such as ministries of environment, science and technology, or natural resources at the national level (Stern 2007). The implication of this for urban areas is that the states where most of the adaptation programs would take place do not have access to the funds, and as such most of the projects are implemented at the national level without due consideration for the people that will be affected by climate change impacts at the city level. Adapting to climate change impacts is challenging and actions that are required are more often than not multilevel, from local to the international, within both public and private sectors. This chapter examines the interactions of different levels of actors within urban climate change adaptation programs and how climate change initiatives might be promoted and facilitated through future multilateral efforts. Some of these actors that are actively engaged in climate change adaptation in West Africa include the International Development Research Centre (IDRC); World Bank; Global Environment Facility (GEF); United Nations Human Settlements Programme (UN-HABITAT); Global Change System for Analysis, Research, and Training (START); Heinrich Böll Foundation; United Nations Development Programme (UNDP); United Nations Environment Programme (UNEP); World Food Programme (WFP); and International Fund for Agricultural Development (IFAD). Some of their networks include the AfricaAdapt Network, the Africa Partnership on Climate Change Coalition (APCCC), and the Climate Action Network – West Africa (CAN-WA). Moreover, government officials, research organizations, development specialists, sectoral experts, and the business sector also participate in climate change adaptation programs in the subregion. Unfortunately, the West African subregion does not have any organization or networks specifically dedicated to urban climate change adaptation, such as those that exist in Asia like Asian Cities Climate Change Resilience Network (ACCCRN) and the United States of America like the Urban Climate Change Research Network (UCCRN). With regard to funding mechanisms for urban climate change adaptation, the current levels of funding earmarked for sub-Sahara Africa are likely to be inadequate to meet the region’s demonstrated need for adaptation finance, estimated at least US$18 bn per year until 2050 (Schalatek et al. 2012). Adaptation projects have only received a meagre percentage of approved funds since 2003. It is within these challenges that urban climate change adaptation is competing for funds. Some of the general funding sources that could be assessed for urban climate change adaptation include the Least Developed Countries Fund (LDCF), the Special Climate Change Fund (SCCF), the Strategic Priority on Adaptation (SPA). The majority of the funds used in climate change adaptation are managed by GEF. Although no fund is dedicated to urban climate change adaptation in West Africa, urban climate change adaptation projects or initiatives from the subregion are allowed to draw from the special fund called the Adaptation Fund. This funding mechanism is a good opportunity for the public institutions at the national and state levels to tap into for urban climate change adaptation initiatives. More importantly, there is the need to develop a framework that will identify all the key stakeholders and their interactions in climate change adaptation initiatives within the context of urban systems in West Africa. The innovation system approach started in the mid-1980s, made popular by Lundvall (1985) and extrapolated to national circumstances by Freeman (1987), Nelson (1993), and Edquist (1997). Over the years, the concept has gradually entered into policymaking processes in developing countries. The concept analyses the distinct institutions which jointly and individually contribute to the development and diffusion of new technologies and which provides the framework within which governments form and implement policies to influence the innovation process (Metcalfe 1995). Traditionally, the climate change adaptation systems in the subregion are characterized by top-down, centralized, and isolated structures. Linkages, interactions and learning mechanisms among the component actors are usually weak or nonexistent. The concept of innovation in this report refers to the activities and processes associated with the generation, production, distribution, adaptation, and use of new technical, institutional, organizational, and managerial knowledge (Hall and Yogan 2002). The agents or elements of interest include research institutes, training and education institutions (knowledge institutions), credit institutions, policy and regulatory bodies, private consultants, NGOs, insurance firms, private sector, and public services delivery organizations (Agwu et al. 2011). The proposed framework attempts to captures the complex relationships between diverse actors, processes of institutional learning and change, market and nonmarket institutions, public policy, poverty reduction, and socioeconomic development in an urban setting. There are four key elements which are central to the functioning of the system. These include knowledge institutions, finance element, business sector, and the state (local) government (see Fig. 1). Knowledge Institutions: The role of knowledge institution in the proposed framework is to produce policy-relevant urban climate change adaptation research outputs as well as create awareness with regards to opportunities for adaptation. They should also be able to train students and support states or local governments on the issues of urban climate change adaptation. A good example in the subregion which states or municipalities can leverage on is the African Centre of Meteorological Applications for Development (ACMAD). The organization is based in Niamey, Niger, and has the mandate to produce information for the implementation of policies to reduce vulnerability and improve adaptation to climate variability and change in the subregion (Niang 2007). Its research focus has been on weather forecasts (including through the Seasonal Climate Outlook Forum for West Africa [PRESAO]) on different timescales (daily to monthly) and over different geographical scales (continental to national). It is also involved in weather forecast communication methods (the Contribution of Rural Communication and Climate Information [RANET] project) and training, especially continuing education, by taking in numerous interns (especially at national weather services) and students. Other key institutions dealing with climate data information include the Permanent Interstate Committee for Drought Control in the Sahel (Comité Inter-Etate pour la Lutte contre la Sécheresse au Sahel or CILSS), Institut de Recherche pour le Développement (IRD), French national meteorological service (Météo France), the Agro-Hydro-Meteorology (AGRHYMET) Regional Centre, and the Climate System Analysis Group (CSAG) of the University of Cape Town. State governments can collaborate with such organizations in the region with mandates on capacity development on urban climate change adaptation. These organizations, as well as local universities, could collaborate on working with urban farmers to develop synergies in building resilient urban agriculture. States seeking to build resilient cities could further collaborate with international agricultural research institutions such as the International Institute of Tropical Agriculture (IITA), International Crops Research Institute for the Semi-Arid Tropics (ICRISAT) and AfricaRice; with UN bodies such as the Food and Agriculture Organization (FAO), World Health Organization (WHO), UNEP and UNDP; and finally with international NGOs such as the World Wildlife Fund (WWF), International Union for the Conservation of Nature (IUCN), Wetlands International and Environnement et Développement pour le Tiers Monde (ENDA-TM). Conversely, civil society organisations with a focus on climate change adaptation in West Africa are very few. However, Le Réseau des Organisations Paysannes et de Producteurs de l’Afrique de l’Ouest (ROPPA) has been of help to farmers across the region (Niang 2007) and as such will be invaluable in helping urban and peri-urban farmers adapt to climate change impacts. Financing institutions: These stakeholders provide the necessary funds for project execution as well as implementation of urban climate change adaptation projects. The main stakeholders in this category are GEF, UN-HABITAT, UNDP, START, the World Bank, commercial banks and the African Development Bank (AfDB). The challenge with this category is the accessibility of funds. To date, only Senegal has been able to access the Adaptation Fund while Ghana has just submitted a project for funding. Participation of private banks in financing adaptation programs is still in its infancy. This brings about the need for venture capitalists who are willing to take the risk in investing in climate change adaption technologies in the subregion. All the other key elements (knowledge institutions, private sector, and state government) of the urban climate change adaptation system of innovation should interact with this element. For instance, the knowledge institutions should be able to approach the financing institutions (public and private financial institutions or international organisations such as the Adaptation Fund and GEF) for research grants. The private sector should also be able to finance climate change adaptation goods or services (e.g., microinsurance, desalination, and wastewater treatment technologies) coming from the knowledge institutions through venture capital or other forms of investment in the urban areas. At the same time, the business sector can approach the finance element directly to borrow money so as to finance identified research outputs that are already at the prototype stage (green architecture, green building, energy efficiency technologies). Countries in the subregion can also develop National Climate Change Adaptation Funds which the private sector can tap into for targeted adaptation actions. Business Sector: This sector includes all firms developing, producing, and providing goods and services that could help build urban resilience. This key element should relate with the knowledge institutions and also invest in knowledge input from universities, research institutes, and patent documents in order to be able to create green goods and services in the cities. The ability of firms to apply new knowledge and technology in products and production processes and reduce their carbon footprints determines how competitive they are. Such ability depends on a high level of management and technical green skills (DTI 2003) which are unfortunately absent in most state governments across the subregion. The private sector must specifically show interest in the development of the university research and development agenda, especially that relating to climate change adaptation in the urban areas. Staff exchange programs between the industry and the universities along with industrial training schemes and internships are also required to facilitate knowledge transfer to and from academia and industry. 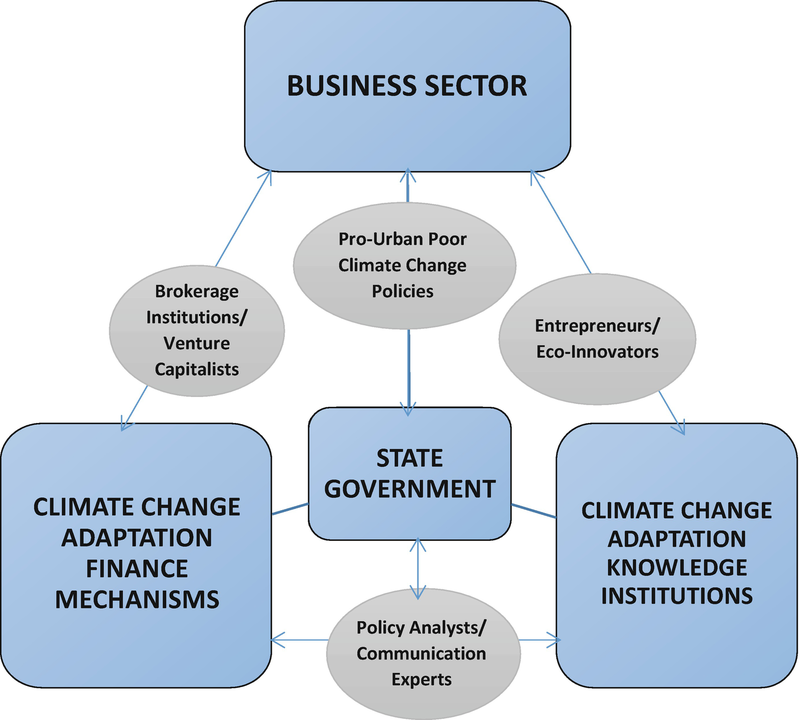 The business sector and the state government could collaborate in the provision of goods and services such as microinsurance, low cost housing, water treatment and desalinization technologies, disaster reduction services, affordable healthcare, water harvesting technologies, green architecture, and microfinance. These activities will help build urban resilience. The State Government: It is the duty of governments to provide an enabling pro-poor policy environment for the knowledge institutions, businesses, and financing sectors to operate. For instance, the government should ensure an enabling policy environment that will allow the business sector to recoup its capital as well as make reasonable profit. This could be achieved by allowing them to borrow at low interest rates or by giving grants and incentives such as tax holidays. Governments should also encourage the private sector to provide certain resilient urban infrastructure while they provide critical infrastructure such as roads, water, and low cost housing for the poor. This could be achieved through public-private partnerships. It is important, however, that governments make pro-poor policies which allow the urban poor to afford these climate change adaptation goods and services. This could be done by subsidizing the poor in the consumption of these services (low cost housing, microinsurance, etc.) The brokerage institutions will serve as intermediaries among the key elements in this framework by providing them with information and advice on climate change adaptation opportunities, intellectual property rights, and awareness about climate change risks and impacts in the urban areas. Institutions such as African Technology Policy Studies (ATPS), African Academy of Sciences (AAS), and the National Centre for Technology Management (NACETEM) could be given the mandate by the regional body such as ECOWAS to executive this responsibility. It is believed that this framework will ensure that urban climate change adaptation activities are integrated into national and state strategies for poverty eradication and sustainable development by advancing and promoting environmentally sustainable demand-driven goods and services. Urban areas are home to over 40% of the people living in West Africa and are already stressed due to unfavorable socioeconomic conditions. Climate change is bound to compound the extant multiple stressors of cities of West Africa through sea level rise, increased flooding, coastal erosion, storm surges, heat waves, increased frequency of droughts, and inland floods which could pollute water supplies as well as other extreme events which affect critical infrastructure such as telecommunication, roads, and energy supply systems. Property, ecosystems and socially disadvantaged city dwellers are not immune to these impacts. All these issues have brought to the fore the need to strategize on how to adapt assets, people, infrastructure, and investments in development objectives against the impacts of climate change on the West African cities and their inhabitants. This chapter explored urban climate change adaptation research activities and identified gaps in research and needs in the subregion. It discussed the way urban climate change adaptation research activities have informed policy in the subregion and outlined the link between countries and the regional economic bodies in West Africa. The chapter provided a critical knowledge base for researchers to support research-based policy formulation for climate change adaptation in urban areas of West Africa. Although there are few city-scale initiatives with respect to climate change adaptation in West Africa, rich experience exists in past interventions on climate change adaptation in general. The present and future initiatives can learn and build on past initiatives so as to realize their intended objectives. In order to ensure sustainability of urban climate change adaptation programs, it is critical that relevant national and state government agencies and departments are brought on board from the onset. It is important that synergies are built among various stakeholders working in the same geographical area and local community so as to ensure success of the program, as well as avoid the duplication of efforts and repetition of mistakes. This implies that there is the need to evolve a framework which will identify all the key stakeholders in climate change adaptation initiatives as well as their interactions within the context of urban systems in West Africa. From the foregoing, adaptation to the impacts of climate change in the urban areas requires adjustments to reduce vulnerability or enhance resilience in both the natural and human systems to observed or expected changes in climate and associated extreme weather events. The chapter revealed that factors such as economic, social, institutional, and technological conditions influence the adaptive capacity of cities to the effects of climate change in the subregion. These factors could facilitate or constrain the development and deployment of climate change adaptation measures across the subregion. There are many opportunities that urbanization could bring to the subregion within the context of climate change adaptation. For instance, the several national adaptation plans and policies could be used by the cities as background information for their adaptation plans. High rates of agglomeration of cities and towns could help make the cities more compact in a way which could bring about smooth administration of adaptation interventions. Urbanized coastal areas in the subregion also have very rich biodiversity, and this has attracted international donors whose mandate is to reduce vulnerability of such ecosystems to climate change impacts. Other opportunities include green building, green landscaping, and increased uptake of research for adaptation policy. Meanwhile, these opportunities are threatened by issues such as civil unrest and insecurity, high levels of poverty and unemployment, and unplanned urban population growth. All these concerns could jeopardize urban climate change adaptation research and interventions. It is recommended that developing urban centres should not only be focused in terms of adaptation actions but they should also be seen as strong factors for regional development. In this way, adaptation actions will be enduring, being able to fulfil the purpose of reducing the vulnerability of urban residents in a robust and more sustainable manner. Urban climate change framework or policy in the subregion should be all-inclusive, integrating policies on employment, income, healthcare, water and sanitation, food price stability, and rehabilitation of the urban and peri-urban economy. The chapter also recommends that in order to build climate change resilience in the urban areas of West Africa, state and local governments should take the lead and formulate policies that address unsustainable use of resources, shortage of technical competence, unsustainable population growth, uncontrolled environmental degradation, bad governance, and corruption. A holistic and comprehensive measure to build and enhance resilience in the cities should also include policies for managing climate change risks, strengthening institutional and social organizations, and enhancing the capabilities of gender-differentiated individuals as well as socially disadvantaged groups in cities: the poor, children, girls, and the elderly. Urban climate change framework or policy in the subregion should be all-inclusive. Such an all-inclusive strategy should integrate policies on employment, income, healthcare, water and sanitation, and food price stability and rehabilitate the urban and peri-urban economy. This framework or plan should be carried out within the context of an urban climate change system of innovation. This chapter was developed from a working paper supported by the AfricaInteract project funded by the International Development Research Centre (IDRC) and coordinated by the West and Central Africa Council for Agricultural Research and Development (CORAF). The authors acknowledge the financial support for the working paper and the coordinating efforts of the Natural Resources Management Program of CORAF.